I’m really hoping Einstein is right about this one because Winter Farm has been invaded by the Disney princesses. 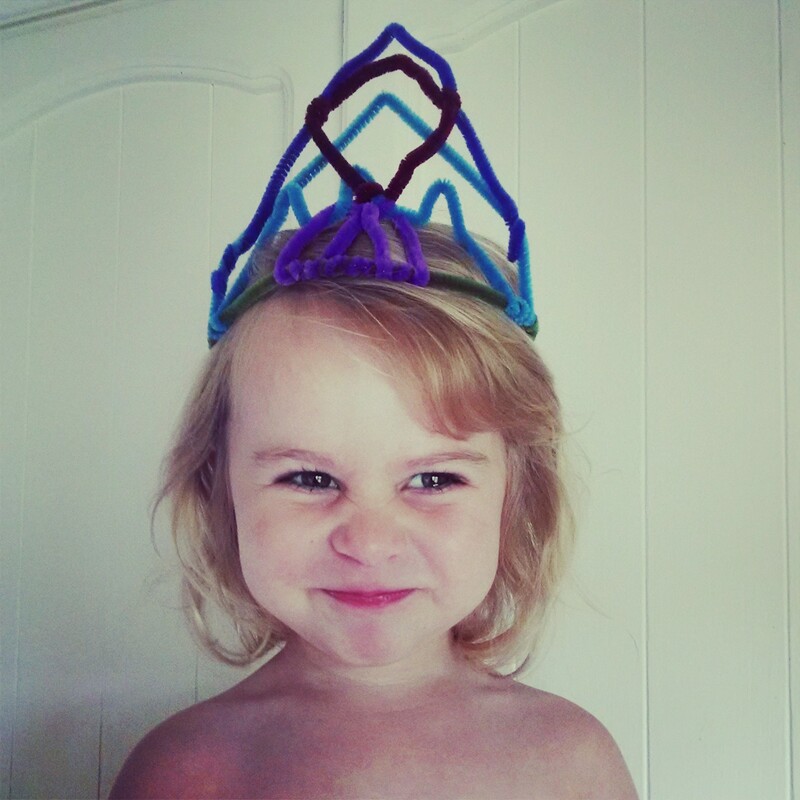 Well, actually, there is just one little three year-old girl who likes to pretend she is ALL THE PRINCESSES. Belle? Check. (Thanks for the fancy nightgown, Grandma!) Since its arrival over a week ago, it has been worn every night and a majority of every day. 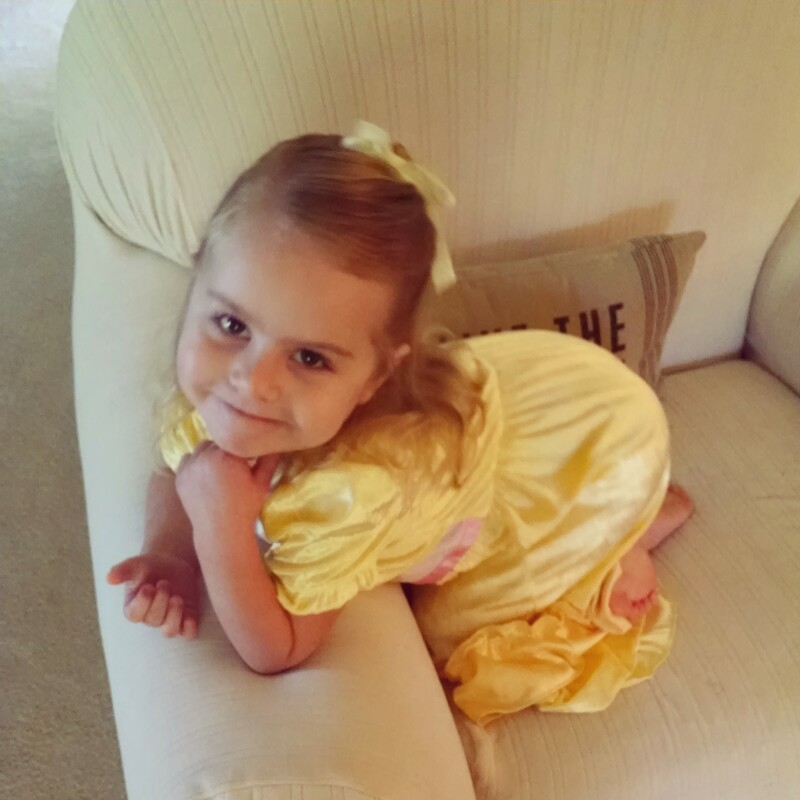 By the way, that hairdo took us 52 attempts and a half dozen crying fits (mostly hers) before we got the “Belle hair” and its requisite yellow ribbon just right. Elsa and Anna from Frozen? Check. 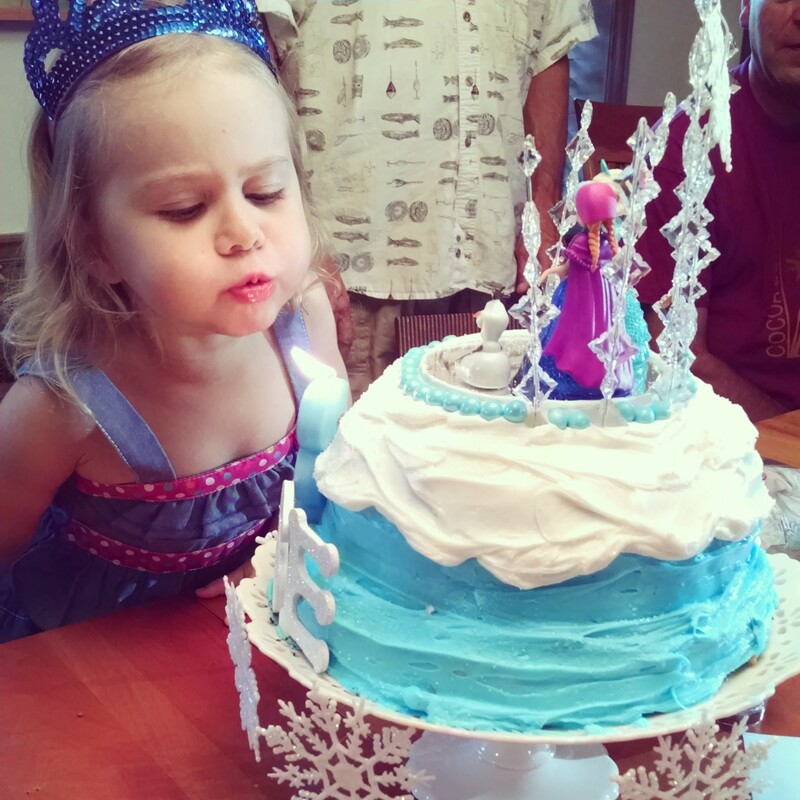 For months prior to her birthday, she told everyone she saw (family, friends, complete strangers) that she wanted a “Let it go” cake. My mom delivered big time on that request. 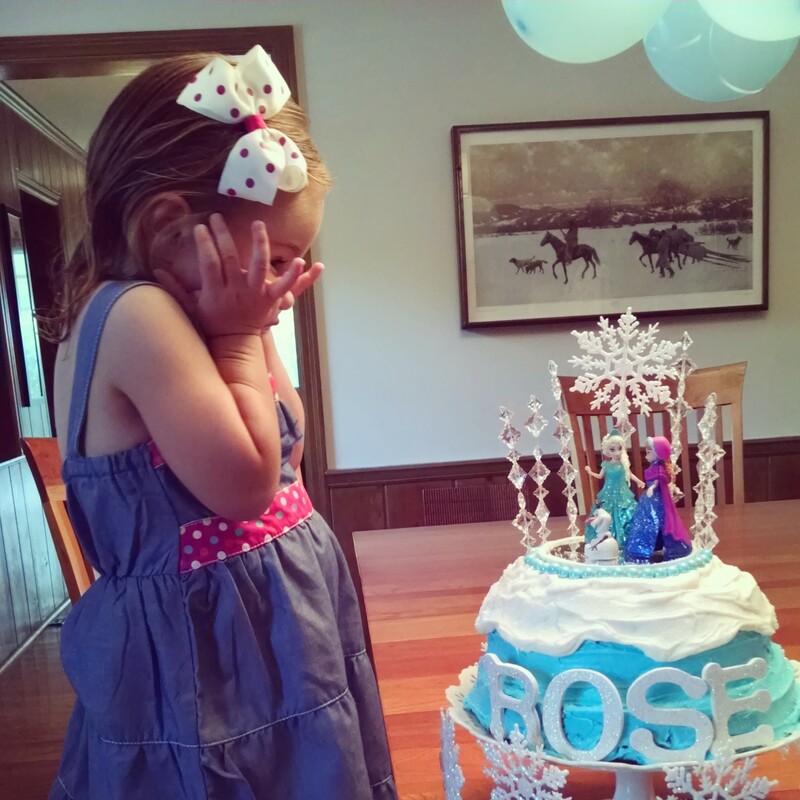 Everyone else followed the birthday girl’s lead and she was showered with tiaras and wands and little Frozen figurines as well as puzzles and books featuring the sisters. She squealed with delight at each of them. 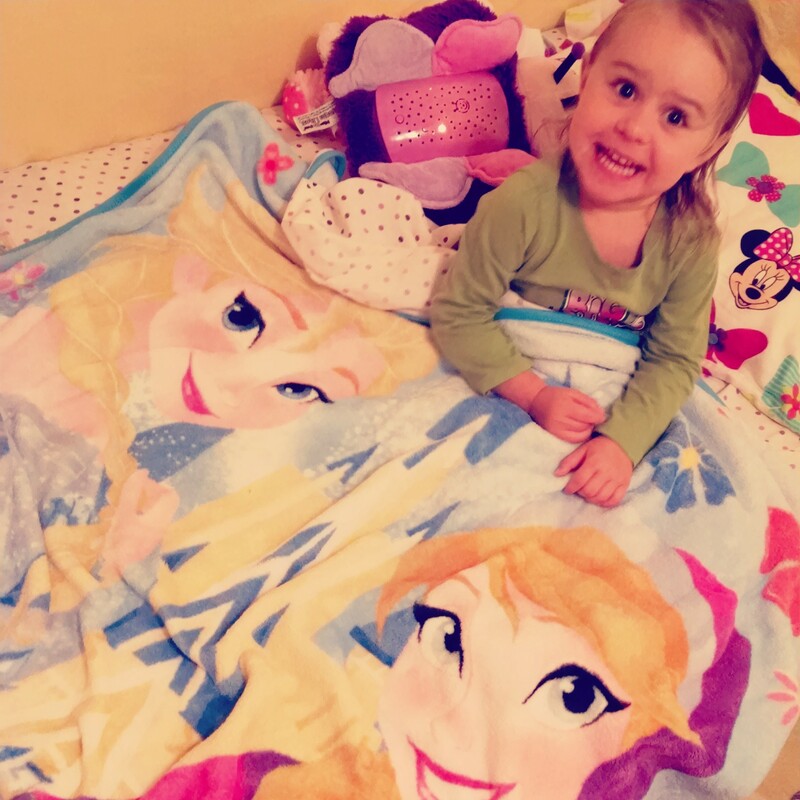 She even stole a page from the Disney princess playbook, expressing her delight with this contrived little pose. Uggghhh. Where did she pick that up?! Oh, yeah, maybe from watching Disney movies a couple (thousand) times. Anyway, when you have a three year-old girl, the princesses are EVERYWHERE. Every checkout lane (even at my beloved and usually brand-free ALDI), every library (generic princess books are unacceptable…they MUST be the trusted Disney characters), and every place where there are children. On the way into preschool this week, we took note of a Frozen t-shirt, a Cinderella backpack, an Olaf poster, a Tangled jacket and her own Disney Princess tennis shoes complete with flashing pink lights. Even seemingly innocent items remind her of her beloved princesses. 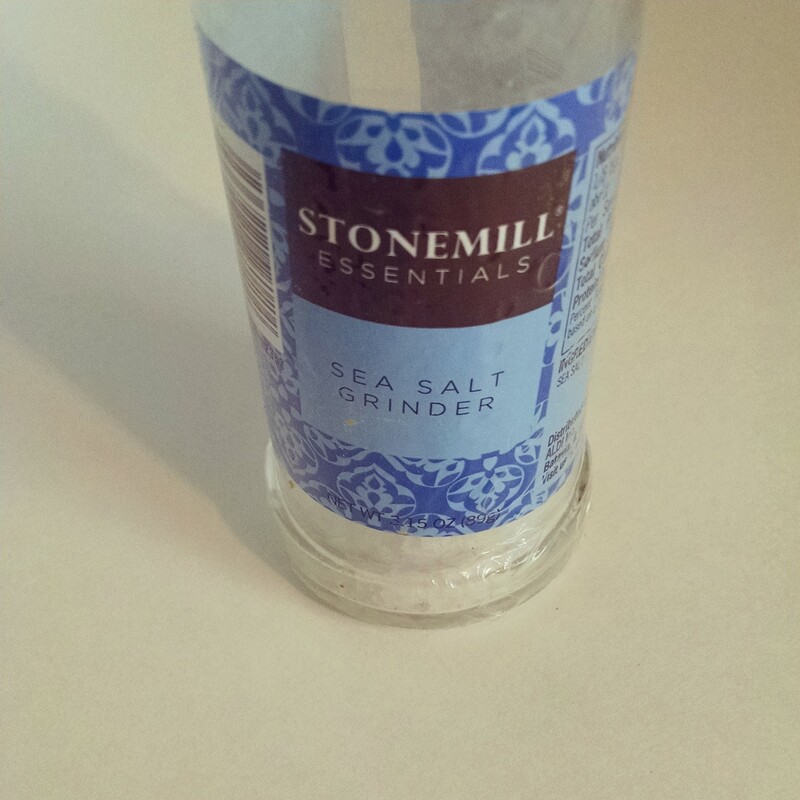 This is now known as “Frozen salt” in our house because of the pale blue and nordic-esque pattern on the label. 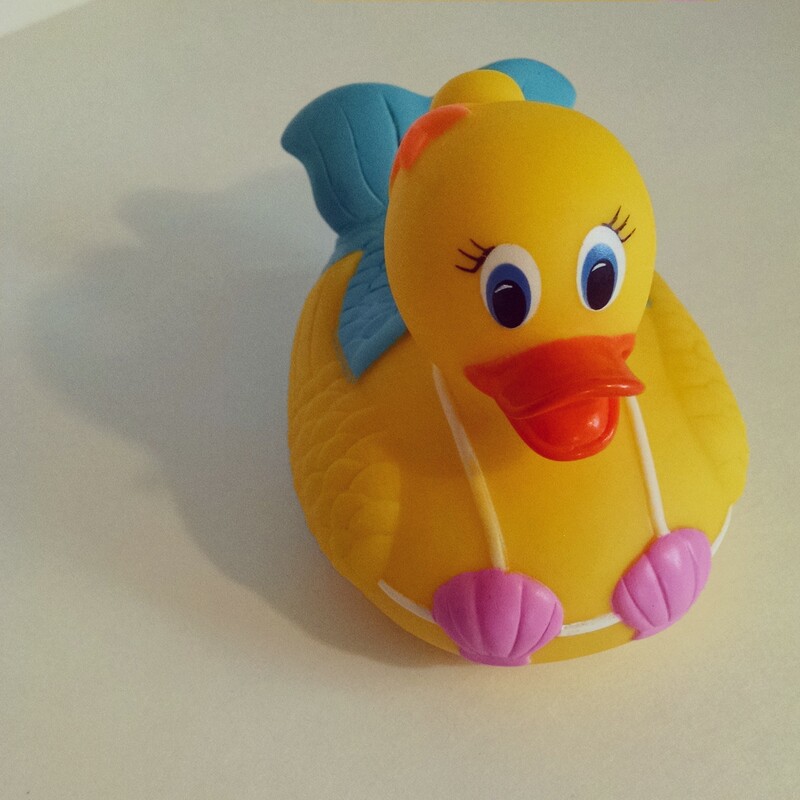 This duck’s name is Ariel. 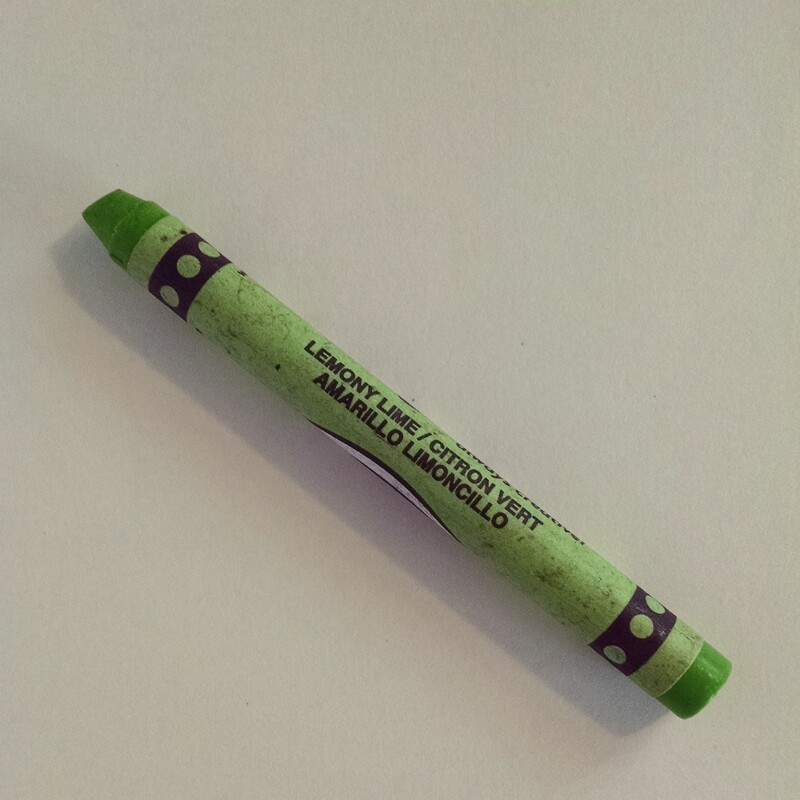 This crayon is the “Tiana color” (or “Tijuana tolor” in three year-old speak) because it matches the princess’s green dress. Disney marketing team = genius and (alarmingly) effective. As cute as this little Snow White is, I am conflicted about my daughter’s preoccupation with princesses. She doesn’t like them for their intelligence or kindness or bravery (and there are examples of all these traits among the Disney cast of princesses). She likes them because they wear pretty dresses and have beautiful hair. Hair and clothes are nice and all, but in my opinion, they should rank beneath a strong education, a confident spirit and a compassionate heart. Hair and clothes will only get you so far in life…at least only so far in the circles I hope my daughter will choose to join one day. An over-emphasis on looks can really mess with a girl’s sense of worth. Several days ago, in an attempt to give my daughter some perspective, I informed her that the princesses wear nice dresses, but they don’t get to do anything else. 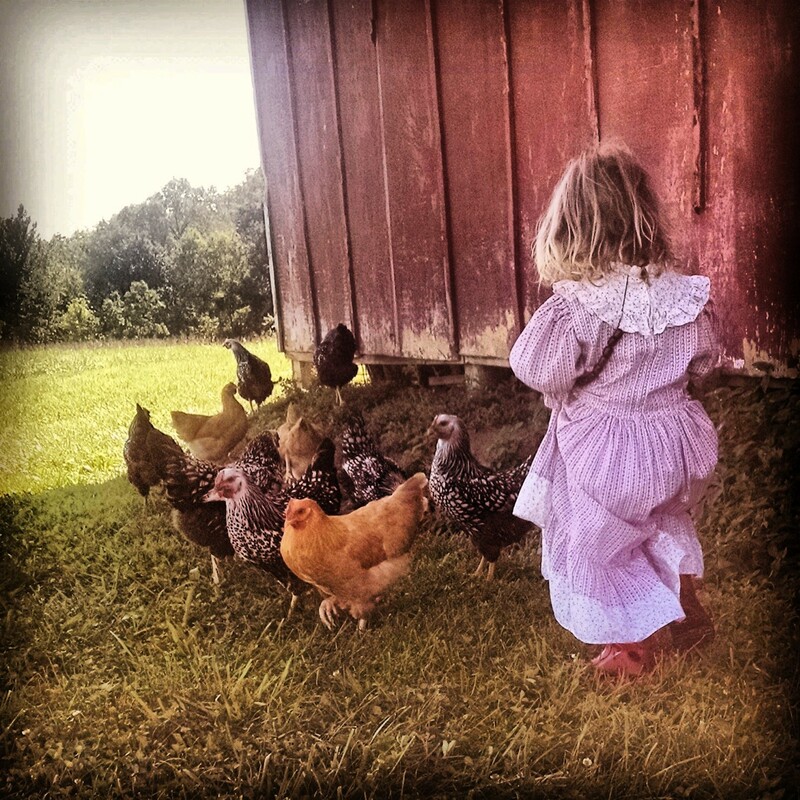 “They don’t get to have chickens like you,” I said proudly. 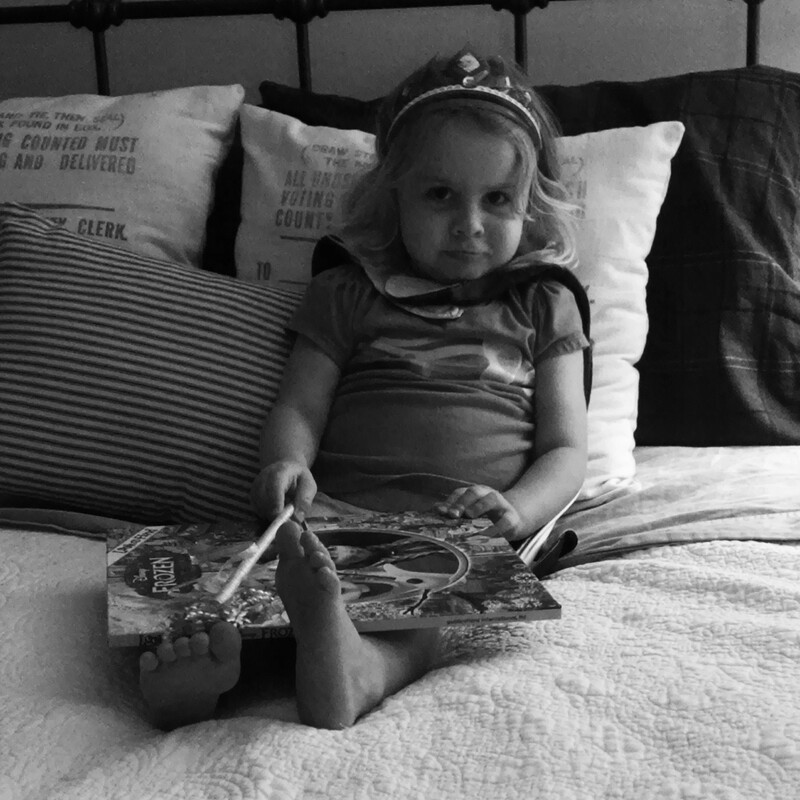 She promptly ran to her room, flipped through her Cinderella book until she found the page she was looking for, and, pointing to her evidence, declared, “Cinderella feed chickens!”. And, lo and behold, there was an illustration of Cinderella feeding her flock of chickens in the courtyard of her home. Busted. A different day, before shooting her little Nerf bow and “arrows”, she insisted on first putting on a dress. I argued with her that you don’t wear a dress to shoot a bow. Again, her books came to the rescue as she held up the cover of Brave, showing a rather fierce looking Merida in a long, green dress. Touché. So, to avoid further arguments (that she would probably win), I occasionally drop subtle comments that I hope will help my case. While licking my wounds from exchanges like these, I comfort myself with the knowledge that, as a little girl, I refused to wear anything but dresses and I loved playing with baby dolls. During my own Disney phase, one of the very few movies we owned was Sleeping Beauty and I probably watched it a thousand times. I remember admiring Aurora’s black ballet flats as she walked through the forest, charming squirrels and princes alike with her singing. Also, I constantly played with Barbie dolls, which are one of the worse possible body image models for a young girl. Yet, I am comfortable with my body today, despite the changes following the birth of my 2 kids. It seems that I survived my childhood girly phase and dangerous brush with princess worship just fine. I found a balance between dresses (which I still like to wear for special occasions) and overalls (which I like to wear for other special occasions, like barn painting). I still find Disney movies entertaining, at least up until the hundredth time I am forced to watch them. And I have decided to let my daughter play with some Barbie dolls from a thrift store. Though I do regularly critique the impracticality of their shoes for farm life. Am I completely at peace with the proliferation of princess paraphernalia in our house? No. Though my concerns now stem less from the psychological damage that so much princess stuff might cause and more from the excess of it all, the consumerism and the constant desire for more toys and clothes and toothbrushes covered in Disney characters. I’d like there to be less stuff in general, not just less princess stuff. I’m still figuring how to tackle that challenge while also allowing family to give the gifts they want to give. And I’ll admit, I’m not innocent either. 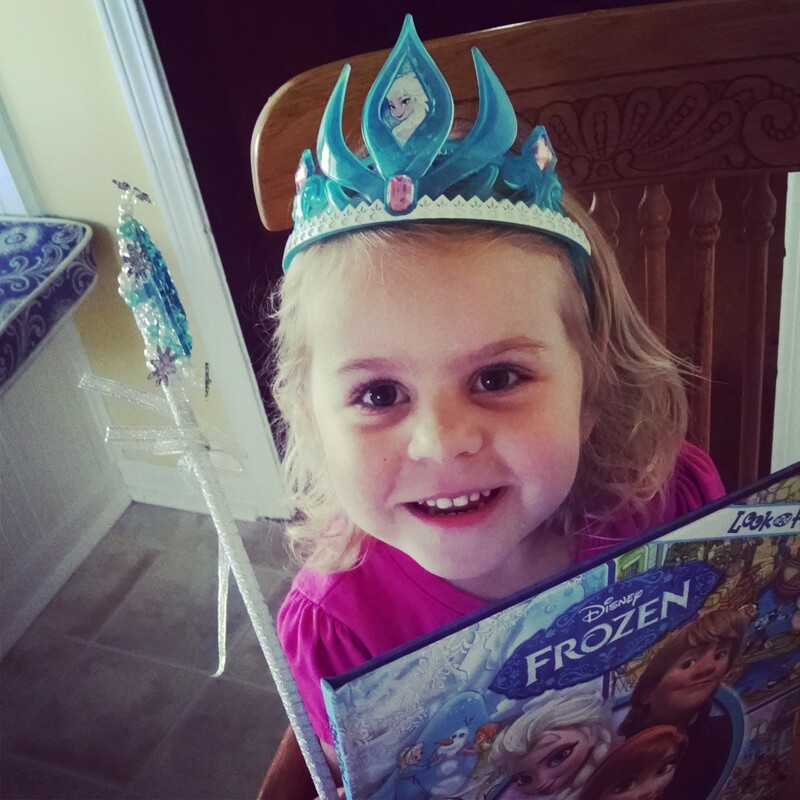 It IS pretty fun to see how she lights up when presented with a new princess book or hair clips. Before the holidays are upon us, I’ll need to give this some more thought. In the meantime, as she pulls her princess shoes on over her princess socks and zips up her (hand-me-down) princess jacket. 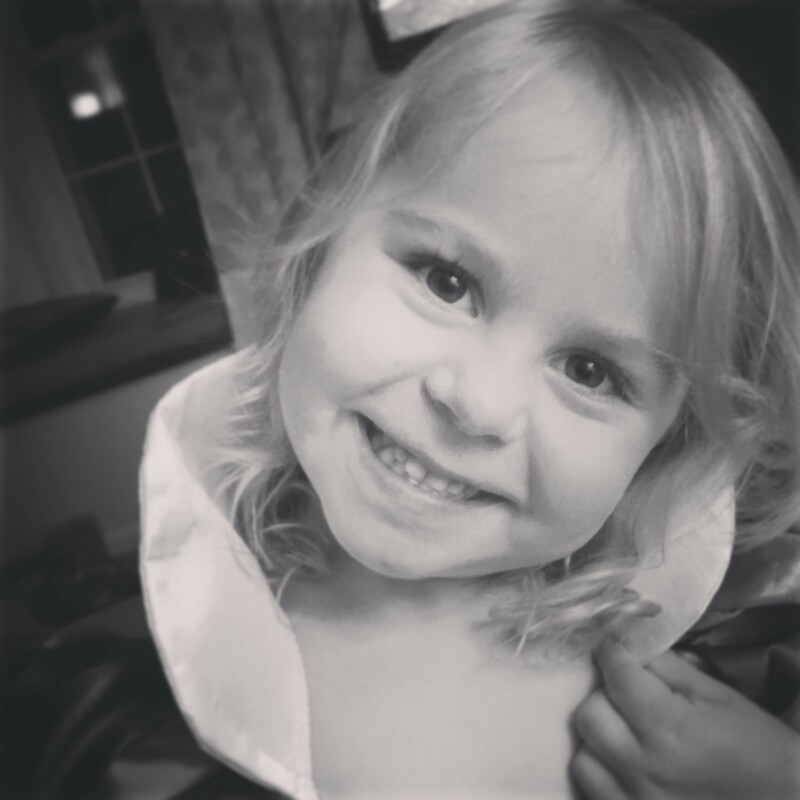 I’ll still continue to pepper her with ammo from my “you’re more than a princess” arsenal, and I’ll continue to be vigilant about not just telling her how cute she is but also how clever and strong and funny she is. I’ll still insist she leave her dolls in the house to help with chores. 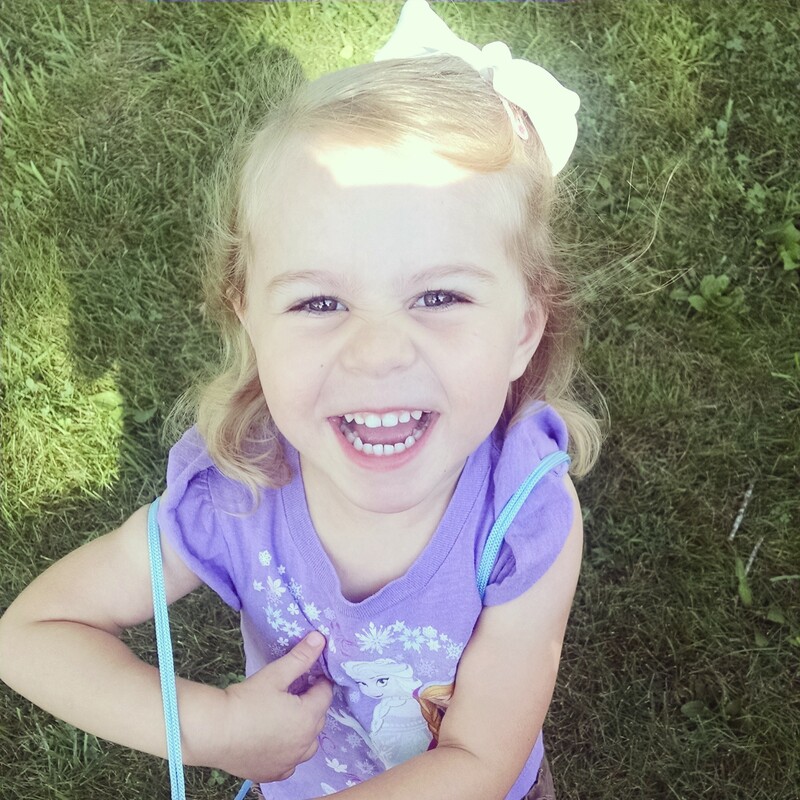 I’ll still encourage her to get dirty and sweaty playing outside with bugs and rocks and sticks. But I think I’d better stop short of banning princesses all together because, you know, Einstein was a pretty smart guy. For a fun list of talking points with your own princess wanna-be, check out this New York Times article. This is regularly on my mind with my nieces as well. On the one hand, I want to indulge them a bit, that is the right of an auntie after all, but I don’t want to feed the princess habit either. I too have taken the approach to compliment kindness, intelligence, etc far more frequently than cuteness. It is a struggle though when they look up with their big blue eyes and ask if they look pretty. 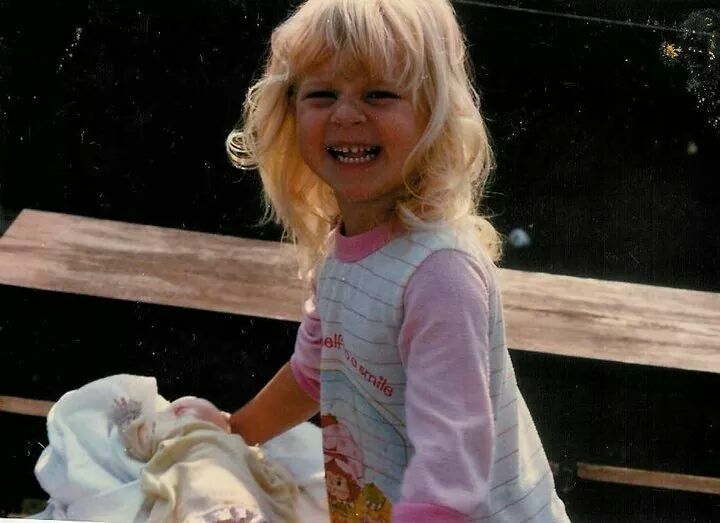 As you mentioned, I have had to remind myself a few times that I enjoyed princesses and barbies back in the day and I turned out to be a well adjusted feminist. I am also thankful for the evolution of the Disney Princess. If the girls are going to be absorbed by them at least we are at a level of Elsa and Marida these days rather than Sleeping Beauty. I agree! Merida and Elsa are far better role models than Aurora and Snow White. It’s a fine line between indulging and encouraging and I’m not always sure I walk it well. I’m also hoping that a few summers of hauling canoes, building fires, and sleeping under the stars at Camp Wood alongside other smart, strong women (like yourself) will do for her what it did for me–build confidence and independence. Keep up the good work on teachig Rose that she is so much more than a pretty face. All your affirmations will stay with her as she grows. I’m so glad I’m not the only one struggling with this. My weakness is thrift store toys and books. “It’s only a quarter,” I tell myself. But in the end, it’s still just more stuff that she really doesn’t need. I’ve tried your approach of encouraging traditionally “boy” toys but Rose will have none of it. She only wants the girly stuff right now. I’ll keep working on her and hoping that this is only a phase. Great post! I laughed out loud about the Frozen Salt. That’s so funny! Laughing aside, I know how you feel. At least you are balancing things out with informing her of her strength, intelligence, and letting her get dirty and play outside. I mean, how many kids get to have chickens? That’s awesome. It’s great that you have these engaging discussions with your daughter (even if she doesn’t yet fully comprehend — she will, eventually!) and also encourage her to be well rounded. Thanks for sharing. Thank you. I’m not sure she’s so engaged in these discussions, but I will keep trying to have them. 🙂 The salt thing still cracks me up, too. 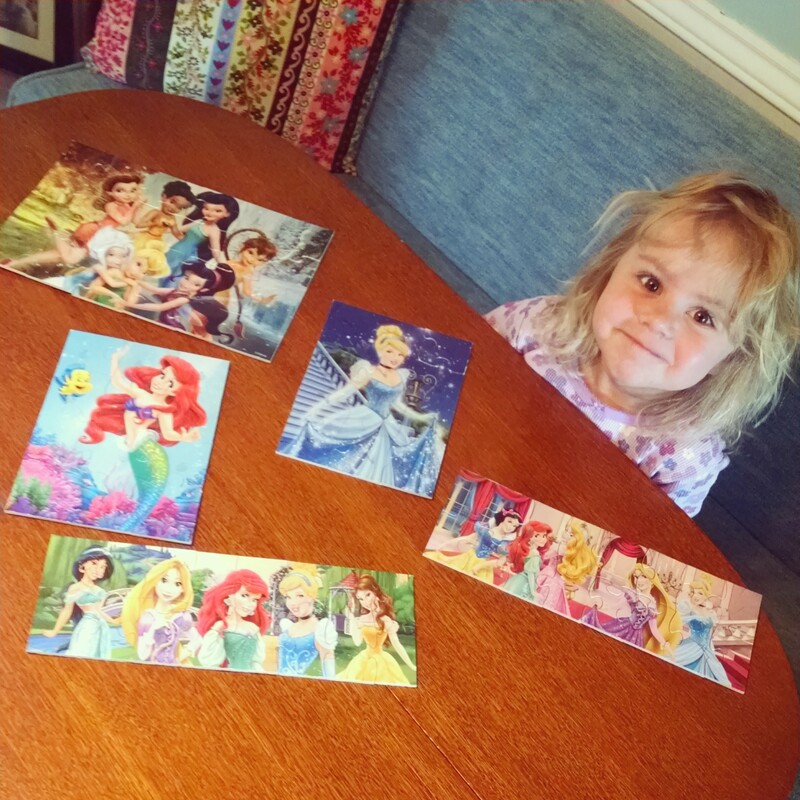 A make- believe world of Princesses is wonderful for a three year old to enjoy! Most of all, children who enjoy and love the fantasy world of books seem to be very successful in school and beyond- it stimulates their minds and instills a sense of wonder which is good at any age! Well said, Chris! I totally agree.